Home Tags Posts tagged with "qunu"
Nelson Mandela’s body has been buried in a family plot, after political and religious leaders paid tribute to South Africa’s first black president at a state funeral service. Graca Machel and President Jacob Zuma were present for the private, traditional Xhosa burial at Nelson Mandela’s ancestral home in Qunu. Jacob Zuma had earlier told the larger funeral service that South Africans had to take his legacy forward. Nelson Mandela died on December 5 at the age 95. The last of 10 days of commemorations for Nelson Mandela began with his coffin being taken on a gun carriage from his home to a giant marquee where his portrait hung behind 95 candles – each representing a year of his life. 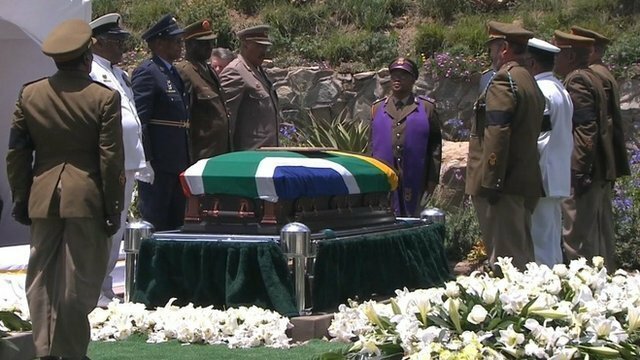 The coffin, draped in the South African flag, was placed beneath a lectern where speakers paid their tributes. Some guests sang and danced to celebrate Nelson Mandela’s life as the service began. After the national anthem, the service heard from a family spokesman, Chief Ngangomhlaba Matanzima, who thanked the army medical team that had treated Nelson Mandela before he died. African National Congress members, veterans of the fight against apartheid and foreign dignitaries – including several African presidents and the Prince of Wales – were among the guests. Archbishop Desmond Tutu – a long-time friend of Nelson Mandela – was also there, as was queen talk-show +Oprah Winfrey. While the service took place, a 21-gun salute sounded far away in Pretoria. President Jacob Zuma, who was booed at last week’s stadium commemoration in Soweto, led the service in song before giving his funeral oration. “Whilst the long walk to freedom has ended in the physical sense, our own journey continues,” he said. An unexpected contribution came from Kenneth Kaunda, 89-year-old former president of Zambia, who lightened the tone of the proceedings by jogging to the stage. He recounted failed appeals he had made to two South African leaders, John Vorster and PW Botha, for the release of Nelson Mandela and his ANC colleagues from prison. As the political tributes overran, the organizers made an unsuccessful attempt to cut back the religious element of the service. The master of ceremonies, ANC Deputy President Cyril Ramaphosa, had earlier explained that burial had to take place at midday, in line with the traditions of Nelson Mandela’s Thembu tribe in Qunu. As the state funeral drew to a close, military pallbearers carried the coffin to the grave site for the more private ceremony. There, a chaplain spoke of Nelson Mandela achieving ultimate freedom at the end of a “truly long walk”. Three helicopters trailing South African flags then flew over the scene followed by six jets. TV pictures of the grave site came to a close. British entrepreneur Richard Branson, who attended the burial, said Desmond Tutu told mourners Nelson Mandela “doesn’t need a stone – he is in all of our hearts”. The former archbishop was at the private ceremony despite conflicting statements on Friday about whether he had been invited. 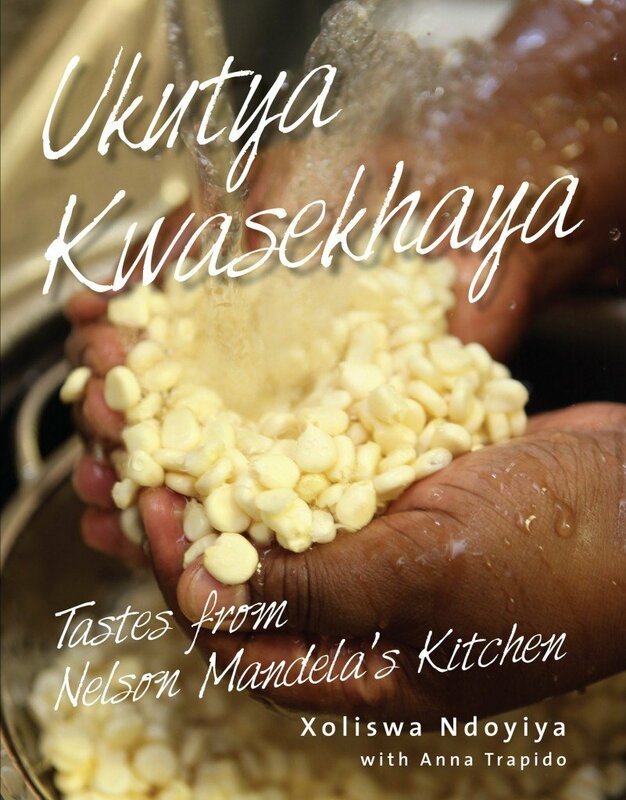 According to tradition, the Thembu community was holding a private traditional Xhosa ceremony – including songs and poems about Nelson Mandela’s life and his achievements. An ox was due to be slaughtered and a family elder was to stay near the coffin, to talk “to the body’s spirit”. The burial brought to an end more than a week of mourning across South Africa. Tens of thousands of people flocked to the FNB stadium for a public memorial on Tuesday, to hear President Barack Obama and other international leaders pay tribute to Nelson Mandela. Over the next three days, at least 100,000 people saw the former president’s body lying in state in Pretoria. Thousands more had to be turned away. On Saturday, Nelson Mandela’s coffin was flown from Waterkloof airbase in Pretoria to Mthatha in the Eastern Cape. A military guard of honor then took the casket on a 20-mile route to Qunu, where Nelson Mandela had wanted to spend his final days. Nelson Mandela’s body has arrived in his ancestral home in Qunu in the Eastern Cape region of South Africa, the final leg of its journey before burial. Large numbers of people lined the roads in the rural region to pay their respects as the cortege passed by. A state funeral will be held on Sunday, December 15, for South Africa’s first black president, who died on December 5. The coffin was flown from Waterkloof airbase in Pretoria on a C130 military aircraft, escorted by two fighter jets. In line with tribal custom, Nelson Mandela’s grandson Mandla accompanied him on the journey, speaking to his coffin to tell him he was on his way home to rest. It arrived in Mthatha, 450 miles away at 13:37 local. 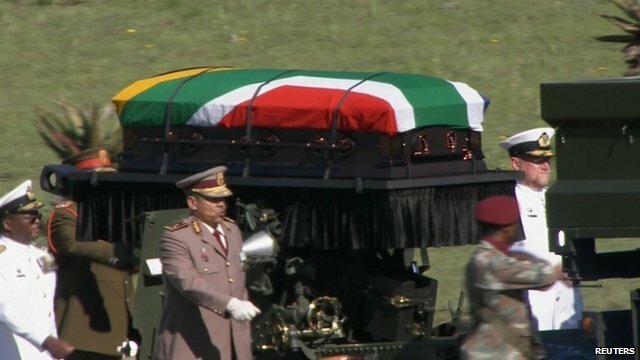 To solemn music, the coffin draped in a South African flag was moved by a military guard of honor and placed in a hearse to begin the 20 miles journey to Qunu, where Nelson Mandela had said he wanted to be buried. People waving flags and cheering and singing – in places 10 to 12 deep – lined the route taken by the cortege through Mthatha town to pay their last respects. Tears as well as smiles could be seen on the faces of onlookers. 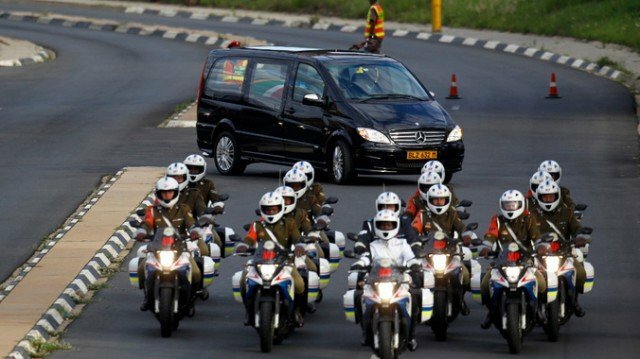 The cortege then drove through the gates of the Mandela homestead in Qunu, where it will rest overnight in the grounds of the royal house of Thembu. The Thembu community will conduct a traditional ceremony – including songs and poems about Nelson Mandela’s life and his achievements – in a giant white marquee that has been specially erected. Some 4,000 people, including presidents from Africa, several prime ministers, the Iranian vice-president, and the Prince of Wales, are expected to attend. However, Archbishop Desmond Tutu – a long-time friend of Nelson Mandela – has cancelled arrangements to fly to the Eastern Cape for the funeral after saying he had not been invited. The African National Congress (ANC) members have paid final tributes to Nelson Mandela at a ceremony in Pretoria ahead of Sunday’s funeral. President Jacob Zuma and other ANC leaders attended the event, which included a multi-faith service and a musical tribute. Afterwards, Nelson Mandela’s coffin began the journey by air and road to his ancestral home at Qunu. It is being accompanied by family members and officials. 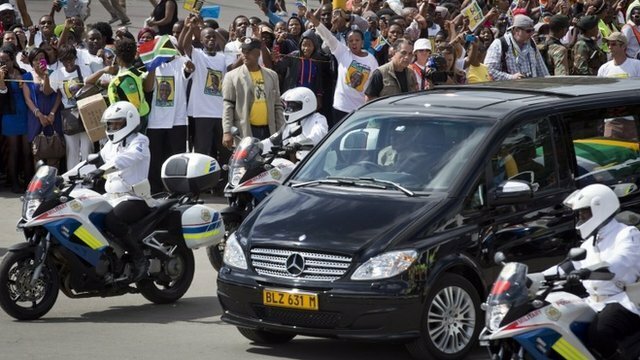 At least 100,000 people saw the former South African president’s body lying in state in Pretoria over the last three days, but some had to be turned away. The 95-year-old former leader died on December 5. More than 1,000 members of the ANC, which Nelson Mandela once led, attended the ceremony at the Waterkloof air base in Pretoria. US civil rights activist Jesse Jackson and Ireland’s Sinn Fein leader Gerry Adams were among the foreign guests invited. “We’ll always keep you in our hearts,” Jacob Zuma said. The coffin is being flown to Mthatha airport in the Eastern Cape ahead of the burial in Qunu. The C130 military aircraft carrying the coffin was escorted by two fighter jets after take-off. Chief mourners from Nelson Mandela’s Thembu clan and family, as well as senior government officials, would be accompanying the coffin, army officials said. 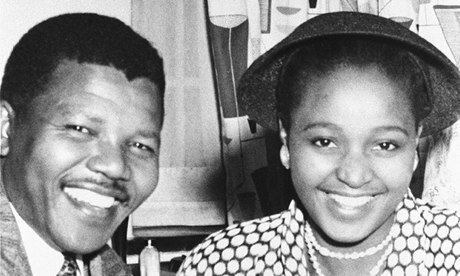 However his widow Graca Machel, and former wife Winnie Madikizela-Mandela, were travelling on a separate flight, in accordance with Thembu tradition. A military guard of honor will welcome the flight in Mthatha, and the coffin will be placed on a gun carriage and transported to a hearse. People have been invited to form a human chain to pay their last respects as the cortege makes its way to Qunu. In Qunu, the Thembu community will conduct a traditional ceremony in a giant white marquee that has been specially erected. On Friday, the South African government said in a statement that “the third day closed with over 50,000 paying their respects to our national icon and first democratically elected president of our country”.